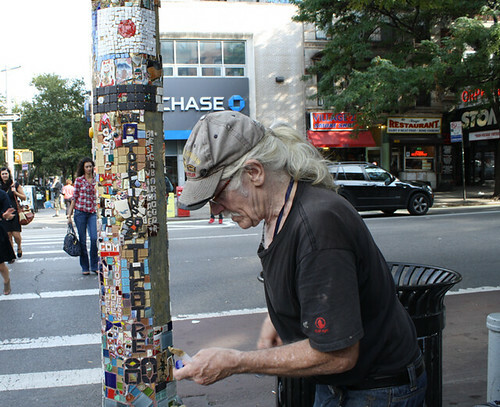 Earlier today, we caught “Mosaic Man” Jim Power decorating a light pole on the southwest corner of St. Marks Place and Second Avenue. He said his latest creation – which includes tiles representing a Japanese flag (a nod to the Tohoku earthquake and tsunami) as well as shout-outs to MosaicMansTrail.com, Neither More Nor Less, and Neighborhoodr: East Village (the employer of Mr. Power’s social media guru) – is his 71st standing mosaic in 26 years of bringing local color. Seen a scene like this? Post your photo in The Local’s Flickr pool. Next post The Day | Ron Paul, President of the East Village?